As with all data coming out of China, it needs to be taken with a grain of salt. Some of it is higher than reality, some lower than reality and for some nobody really knows what it is exactly. However, most of the time, it can indicate a pretty reliable trend. For example, nobody believes that GDP growth was 7.3 percent in the first quarter, but the trajectory is clearly going down. Now another number has hit the official limelight: Capital outflows. According to official data, China recorded the highest balance of payments deficit ever in the first quarter of 2015. It was only $80 billion but it means that a record of $159 billion in capital left the country to look for better returns elsewhere. Except for one quarter in each 2012 and 2014, capital was always going into China—at least officially—but now we have the third negative reading for capital and trade combined. First because money keeps leaving and second because trade has collapsed recently. On the surface, Chinese officials aren’t worried, but they should be: “Recent capital outflows represent an adjustment that is within expectations. 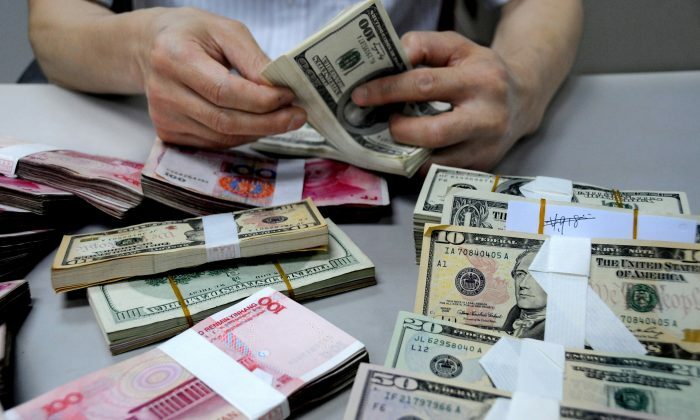 One can’t equate them with illegal and secret capital flight,” said Guan Tao, the head of the balance of payments department at the State Administration of Foreign Exchange earlier this year. They should be worried because beyond the surface, capital outflows could be in the trillions already. “Asia’s large portion of the global total is driven by illicit outflows from China—the leading source of illicit financial flows from developing countries for nine of the ten years of this study,” states a report by Global Financial Integrity, which tracks capital flows beyond the official numbers. The report said China already exported $1.25 trillion over the 10 years up to and including 2012, which saw $250 billion of outflows, much higher than the 2015 official number already. This is bad news, for several reasons. First, it decreases the central bank’s balance sheet, which adds deflationary pressure in an already deflationary environment. Second, it puts pressure on the currency, when large numbers of yuan are exchanged for dollars and other currencies. This is not what China wants, as it is contending to become part of the International Monetary Fund’s reserve currency. Last but not least, foreign currency reserves and a stable currency enable a country to buy goods and services from abroad it cannot yet produce by itself. If China really wants to make the transition from a manufacturing to a service economy, it will need capital to do so.